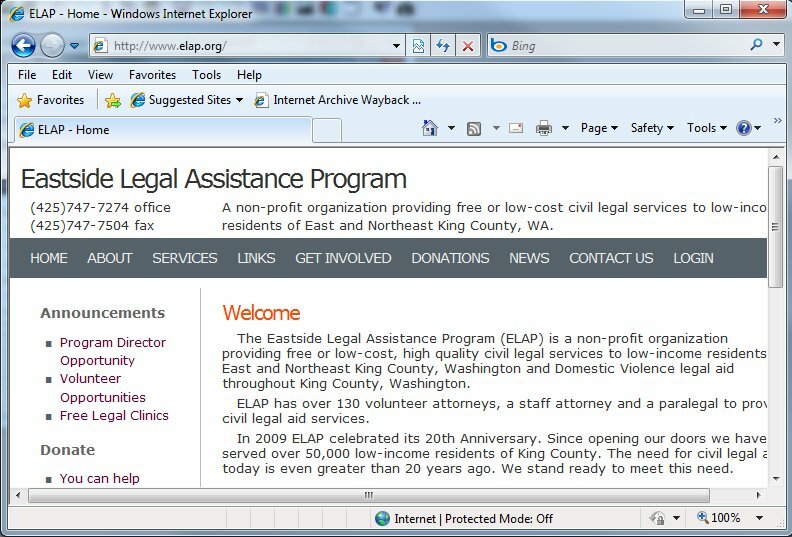 Eastside Legal Assistance Program is a non-profit organization that provides, quality legal services to low-income residents of East and Northeast King County Washington. 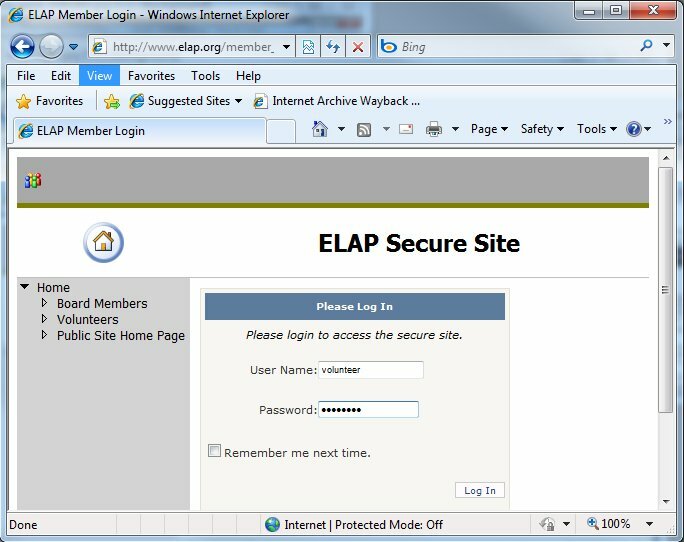 Gathering content and suggestions from the staff, I used Microsoft Expression Web to create a new web presence. 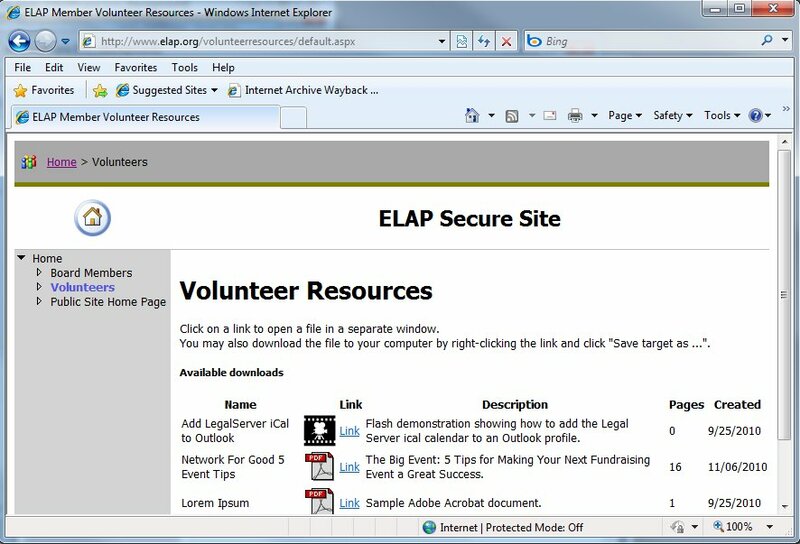 The original site was a single page created by a student office admin volunteer. The web	site is hosted by Drizzle Internet in Seattle which also provides POP3/IMAP email. The feedback we received from clients said we needed more information about the services we provide and timely updates on news and events. To that end, we created a Social media standing committee to make our presence known on Twitter, FaceBook and a Blog. I added a self-hosted blog using Wordpress. It's hosted at Drizzle on a LAMP (Linux, Apache, MySql, PHP) stack. We have a volunteer who tweets and updates Facebook and the blog. The last and possibly the most embarrassing oversight I made at the beginning was not emphasizing a way for a client to connect with us through our web site. Originally, a page with our phone number and a "mail to:" link seemed to be all that was needed until I realized that the folks who needed to connect with us may not have or were in a place such as a library that didn't have an email program available. It's easy to create a forms page. Include validation using java script or the asp.net server-side controls. Getting the results to our intake person via email took a little bit longer to find the appropriate .NET Framework class that would work. More on that topic in a blog post. For now, things are going well.